Top executives from Google, Microsoft, IBM, Oracle and Qualcomm are gathering at the White House amid strained ties between President Donald Trump’s administration and the tech industry and an ongoing trade war with China. The White House is calling the Thursday lunch meeting a listening session to field ideas for securing American dominance in artificial intelligence, quantum computing, advanced manufacturing and faster wireless technology known as 5G. Trump is not expected to attend, but his daughter and adviser, Ivanka Trump, is helping to organize the gathering. Those scheduled to attend include Google CEO Sundar Pichai, Microsoft CEO Satya Nadella, IBM CEO Ginni Rometty, Oracle co-CEO Safra Catz and Qualcomm CEO Steven Mollenkopf. Some of Trump’s policies on trade and immigration have antagonized the tech industry. The trade war between the Trump administration and China has threatened to make products like iPhones more expensive as Trump has warned of possible new tariffs on Chinese-made goods. The Commerce Department is exploring new export restrictions that would target industries where China is hoping to get ahead, such as artificial intelligence and robotics. And a recent U.S.-Chinese cease-fire over the tariff dispute was at risk of derailing this week as Canadian authorities arrested an executive for Chinese phone-maker Huawei Technologies for possible extradition to the United States. U.S. Trade Representative Robert Lighthizer and chief economic adviser Larry Kudlow are attending the Thursday summit, in part a reflection of the heightened concerns about trade. Former Secretary of State Henry Kissinger, who has recently expressed interest in AI, will also be there, as will the presidents of top engineering universities such as Carnegie Mellon and the Massachusetts Institute of Technology. The meeting will be the first of two high-profile Washington visits this month for Google’s chief executive. 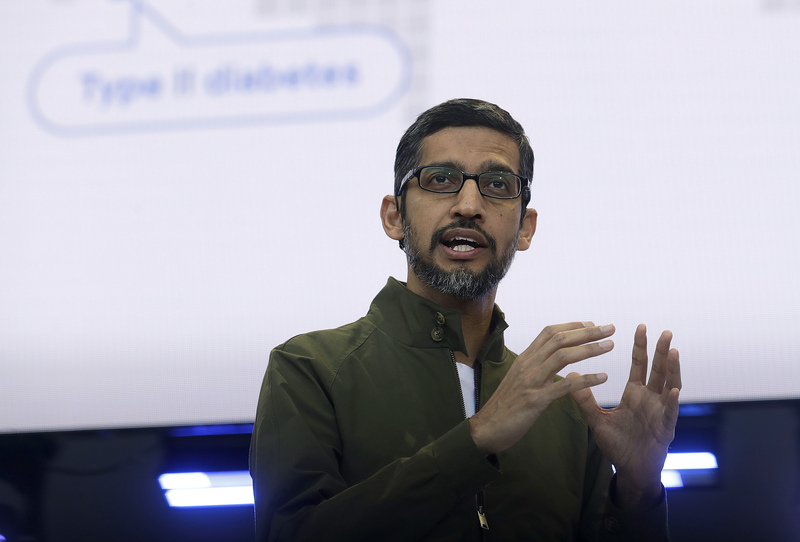 Pichai is also scheduled to testify Tuesday at a congressional hearing on the company’s business practices, just three months after aides put up an empty chair to symbolize his refusal to appear. Notably absent from Thursday’s White House attendee list is Amazon CEO Jeff Bezos, a frequent target of Trump criticism. Also not attending are Apple CEO Tim Cook and Facebook CEO Mark Zuckerberg. White House senior officials downplayed those leaders’ absence Thursday, along with the president’s likely absence. They described the meeting as part of what will be an ongoing series of private sessions to gather expert input that will later be elevated to the president’s attention. Ivanka Trump is also attending a separate business gathering in Washington on Thursday that includes the CEOs of IBM, JPMorgan Chase, Walmart, Boeing and AT&T.